I originally tested with FTDNA in 2014. Then, I uploaded my files to MyHeritageDNA, GEDMatch, and LivingDNA. Recently, a cousin sent me an AncestryDNA kit. I’m almost everywhere! Or, at least, my DNA is. These are my impression of AncestryDNA after my results went live 30 September 2018. I knew their database was big. I didn’t know how big. I have 3,400 matches and several are quality matches. I have a little over 1,000 matches at FTDNA and 1,900 at MyHeritageDNA. 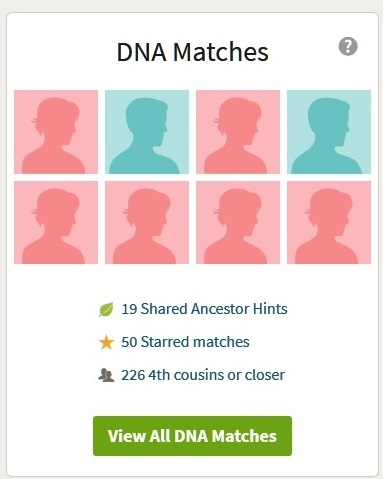 AncestryDNA gave me more matches than both of them combined. I noticed several cousins right off the bat. In just a week, I’ve identified 50 connections to my family tree. Consider this, I’ve identified eight at FTDNA in four years and three at MyHeritageDNA in two years. Because I’ve identified so many, I can start to divide people into groups passed on different parts of my tree. That’s impressive after only one week. Each match has a shared match button. You can then see who your shared matches are. Meaning, the people who you and your match have in common. There is a place to make notes for each match. You can “star” them to remember later which is nice when you have over 3000 matches to sort through. While it is easy to navigate, some features are only available to those with full Ancestry subscriptions. You can not view the family trees of your matches without a full Ancestry.com subscription. I’ve had a family tree on Ancestry for sometime. But, it was a simple tree used to bait one group of cousins on the East Coast. (It worked!) Now that I’m trying to resolve DNA matches, I’ve started adding to my tree. 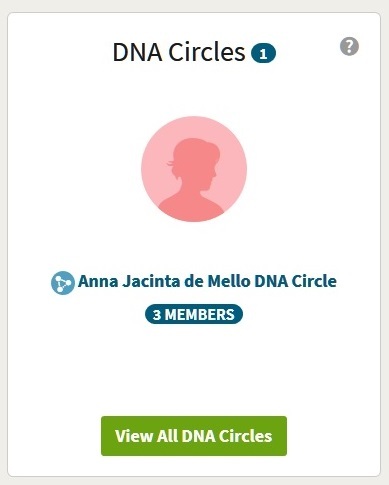 AncestryDNA has identified one DNA Circle for my great great grandmother Anna Jacinta de Mello. It has 3 members. DNA Circles are created with the system finds your ancestors in another match’s tree. The problem is I can’t view that circle. I have to be a paid Ancestry subscriber in order to see who is in the DNA circle.. That’s a bummer. I did learn that if AncestryDNA puts someone in a DNA Circle it puts a symbol on their profile page. I have to scroll through my matches to find these people, but at least the information is there. It makes me second guess whether I want to input any more people into my family tree. I guess it is helpful in luring people to look at my tree. If AncestryDNA had been the first company that I tested with I would probably be elated. However, there are some basic tools that I miss. A chromosome browser is the main utility used at other testing sites to figure out DNA matches. It seems much more challenging (impossible?) to work with matches without that utility especially if your match is just getting started with their family tree. This could be overcome if AncestryDNA gave you DNA sequence information for each match, but it doesn’t You can see you how many total centimorgans you share over how many sequences, but it doesn’t tell you where they reside on each chromosome. That’s a negative in my book. Without the chromosome browser, they could at least identify the chromosome sequences. Then, you could create your own chromosome browser charts. 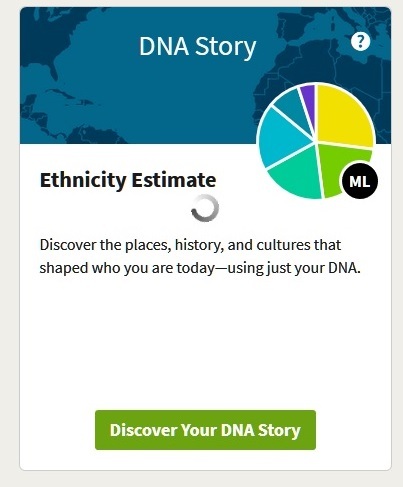 AncestryDNA did an update in September 2018 on its ethnicity algorithm. I was excited to see that it found my Irish and Welsh roots. Yea! MyHeritageDNA and FTDNA miss my Irish and Welsh.It didn’t find my British roots. None of the testing companies have. I find that baffling since my great grandfather was supposed to be British on both sides. Maybe he lied about that, too. It split my Iberian into Basque, French, and Portuguese. Yes! But, it downgraded my Portuguese considerably. It was able to identify my Basque roots from Southern France, but added Spain. My poor Portuguese have been demoted. It makes sense that I have a lot of French/Basque DNA. My dad’s side is 100% French/Basque all from the same region. That’s half my DNA. My mom’s father’s ancestry is entirely Azorean/Portuguese from Sao Miguel Island. Her mother’s side is divided between British, Irish, and Welsh. The French certainly are well respresented, I’ll say that much for the estimates. I am sure some time in the future there will be a happy medium on ethnicity estimates. AncestryDNA tests are all the rage. Have you tested with them? What are your impressions? I would really love AncestryDNA’s set up if they had better utilities and tools to work out my matches. Without the chromosome browser, it is much more difficult. The ethnicity estimates are getting better. To be honest, it’s the least interesting aspect of DNA testing to me. My paper trail is fairly strong. I know where the majority of my ancestry comes from. There is no equal to the number of matches you get. I’m super excited to have identified several matches so quickly. This is the fun all those researchers with Colonial American roots have been having without me. My biggest hope is that among all these matches someone will be related to Harry Jackson, my great grandfather. That person will be related close enough that we can put the family story together and give him back his parents. Now, I’m off to see if I recognize more names on my match list! I agree with you all around on the points you made about AncestryDNA. Good luck with finding Harry’s parents. It seems doable considering he is “only” a great-grandfather and the 3rd cousins matches would be the ones who share his parents. However as I was thinking about my own brick wall (2nd ggf), I realized if Harry was an only child then you would be looking for 4th cousins who share his grandparents. This realization has me rethinking the search for my William A. W. Dempsey’s parents or better yet, his grandparents. Isn’t this fun? Cathy, It sounds like you have a similar road block. Family lore says Harry Jackson was one of 18 children. You’d think my DNA results would be brimming with Jackson descendants. I was somewhat disappointed when I saw that a couple of my Jackson cousins had tested but they didn’t help in this area. The tree splits between Jackson and Jones (and then further to Kelly and Dolan). Everyone of the my Jackson matches also matches my Jones, so they aren’t from the right branch. I remain hopeful. Some day! Your post could have been written by me. Really. I first tested with FTDNA, uploaded to MyHeritage and GEDMatch and enjoyed working with FTDNA and its tools. I recently tested with Ancestry and I’ve found that while I have a lot of matches and known cousins showing there, I just can’t do much with them because I do not see the value in me subscribing to Ancestry’s service since I only research my own ancestry. Now, if I was a professional, it would make sense but as it is, it does not. My DNA testing has confirmed my paper trail genealogical research back to a 7th-great-grandfather(!) yet has not given me so much as a hint as to the identity of the father of my great-grandfather was since his mother was an unwed mother in the 1850s. Given the number of matches that seem to be related on this line, compared to the number of matches on other lines, many of which have several quick dead-ends in their trees also, I tend to believe this great-great-grandfather was a bit of a philanderer. Matt, We are like DNA research twins. LOL I have had a similar experience with the different companies. AncestryDNA, by the sheer size of its member base, could be so much more useful if they added a chromosome browser and allowed you to see the family trees of your matches. They wouldn’t even have to give you access to the rest of their service. I also have a similar problem with my mother’s grandfather. He left nothing but his name, that he had been a sailor before marriage, and that he was from England. While I can pinpoint matches for all my other lines, I have yet to identify anyone that belongs to Harry Jackson’s tree. All the matches who match Harry’s descendants also match those of my great grandmother. He was said to have 17 siblings. It shouldn’t be this difficult to get one match. Good luck with your genealogy research!